This is one of my family’s favorites! 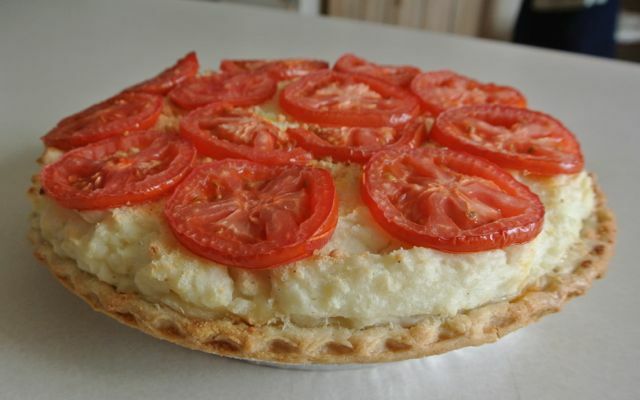 It is a potato and cheese pie topped with tomatoes. I like beefsteak tomatoes for this recipe the best. But this time of year, it can be hard to find them. When you do find them, they tend to be pale and without much flavor. Tonight I used Roma tomatoes. Peel, slice and boil potatoes. Mash well. Mix with cottage cheese, sour cream, salt, and pepper. Spread mustard in pie shell. I use the back of a small spoon to spread. Fill with half of potato mixture. Layer with Swiss cheese. Top with remaining potato mixture. Dot with butter. Sprinkle with Parmesan. Arrange tomato slices in a single layer on pie. Return to oven for 10 more minutes. Cool for 30-45 minutes before serving.